Back Row: Eric Miners, Josh Greet, Keitha Rice, Esther Greet, June Strachan. Betty Edwards, Betty Osborne, Ronnie Williams, Tino Casterino & John Ferret. 3rd Row: Doreen Greet, Edna Bending, Pat Hore, Vera Mannell, Joan Tredinnick, May Mitchell, Sybil Rice, Joan Treweek, Dot Mitchell & Phyllis Solway. 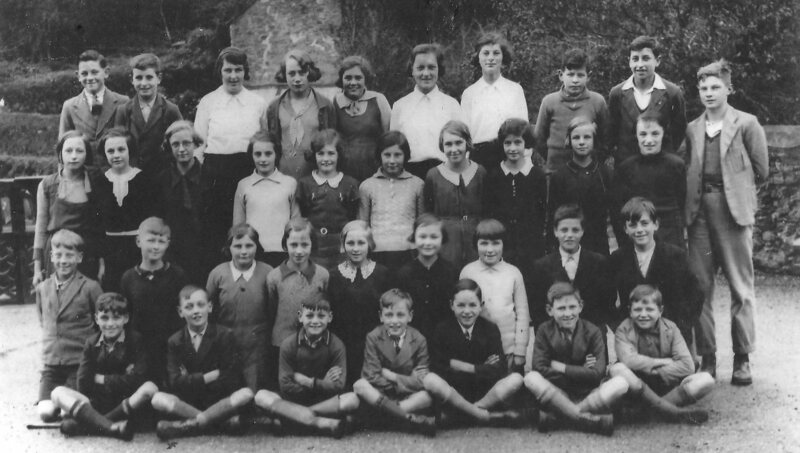 2nd Row: Mickey Hore, George Fowler, Venus Biscombe, Annie Rilstone, Jean Higgins, Kath Welch, Hazel Matthews, ? Blewett & Wilfred Woodward. Front Row: Leslie Keast, John Williams, Donald Pascoe, Oswald Rilstone, Derek Tregilges, ? Thomas & Ronnie Higgins.